It is the plane that could finally end the argument over who gets the window seat. 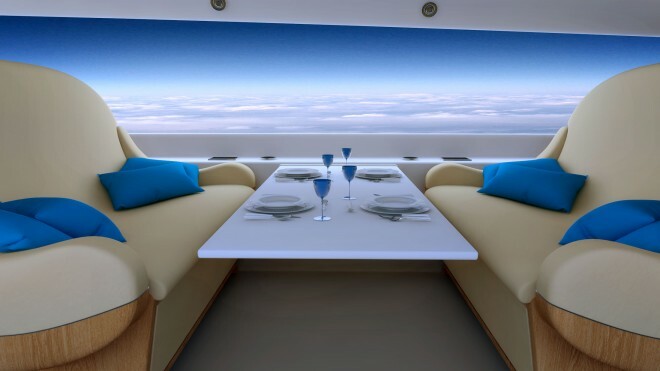 A firm attempting to build a private supersonic jet has revealed a radical new design where the entire cabin wall is a screen that can be turned into a giant window. Live video from outside the plane can create a panoramic image - or the passengers of the $60m jet can opt to have their family snaps shown or even watch a movie on the walls. 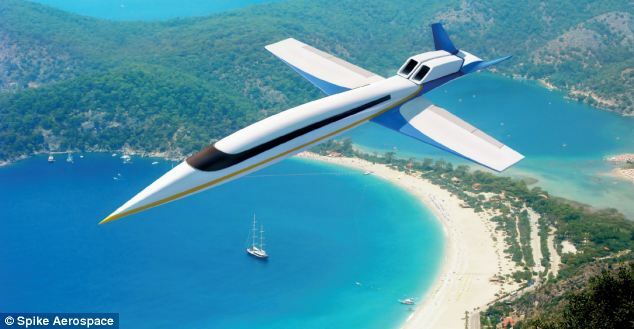 The Spike Aerospace S-512 claims to be the 'first supersonic business jet' and promises to cut flight times in half so that busy billionaires will be able to travel from New York to London in just three hours. However, such convenience and speed comes at a price, as the jet will cost between $60million and $80million (£36.3million and £48.4million). The engineers, who have previously worked for aerospace giants such as Airbus, Gulfstream and Bombardier, have spent the past two years designing the luxury aircraft and believe the jet will be capable of flying between New York and London in three hours. LA to Tokyo will take just five hours and London to Mumbai, four hours, according to the firm. ‘It will save passengers time so they can explore more of the world,' the company said. 'Wouldn’t you love to go hiking in New Zealand for the weekend, or fly to Paris for lunch? 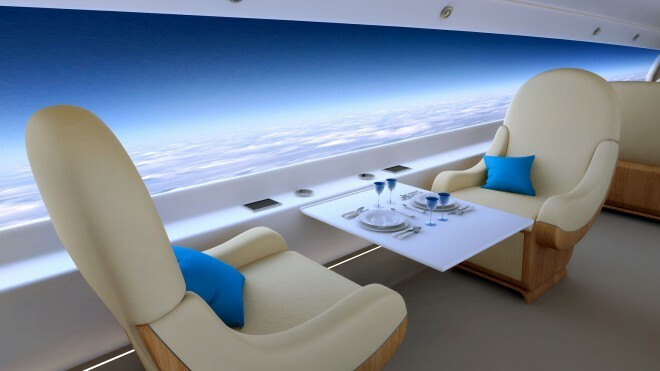 The new supersonic jet will also feature a revolutionary windowless passenger cabin so no more glaring sun and no more shades to pull down or push up. Instead, the interior walls will be covered with a thin display screens embedded into the wall. Cameras surrounding the entire aircraft will construct breathtaking panoramic views displayed on the cabin screens. Passengers will be able to dim the screens to catch some sleep or change it to one of the many scenic images stored in the system. 'There are several reasons for removing the windows from the cabin,' the firm said. 'It has long been known that the windows cause significant challenges in designing and constructing an aircraft fuselage. They require addition structural support, add to the parts count and add weight to the aircraft. But until recently, it has not been possible to do without them.